When Benton High ninth grader Carson Braun and his family arrive November 29 in Tennessee for his checkup and to participate in the St. Jude Memphis Marathon, they will be giving back to the place that has helped Carson defy all odds — as well as another student. Curing childhood cancer is something the Benton Elementary Tigers take to heart. Not only is Carson a former student, but his mom Ginger teaches kindergarten there. Fourth grader Brock Cassel is also a cancer survivor who received life-saving treatments from St. Jude Children’s Research Hospital and goes back for annual checkups, so the Tigers’ connection runs deep. 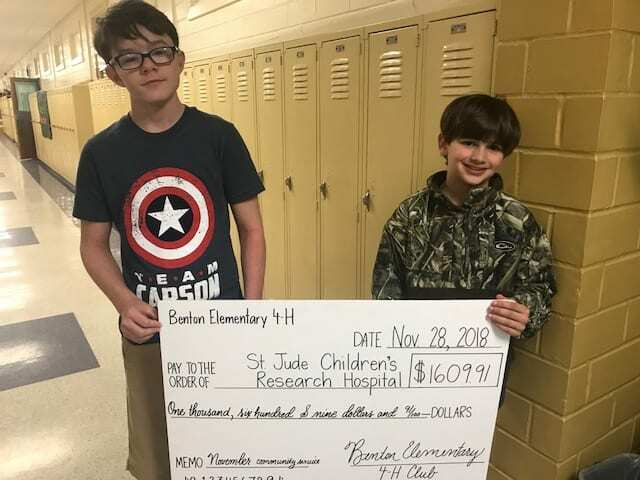 Knowing the Brauns planned to participate in the St. Jude Memphis Marathon, Benton Elementary 4-H Club Leaders Londa Croall and Jennifer Allen pitched an idea to collect “Coins for Carson Braun and Brock Cassel,” and 4-H members ran with it at full speed. A friendly, but fierce classroom coin competition ensued and in just four days, the Tigers collected more than $1,609. That’s not counting another $600 raised on Jeans Day. Before the Brauns left for Memphis, 4-H Club President Emerson Fite made the presentation to the Brauns, Brock Cassel and his family. 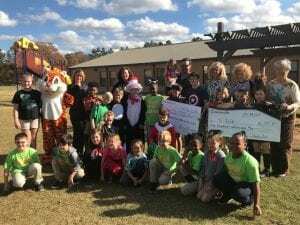 Stacy Craft’s second grade class was also thrilled to learn they collected the most money — $195 — and would be treated to a pizza party for their winning efforts. It was particularly special for Craft, who was Carson’s teacher at Benton Elementary. Diagnosed in 2004 with a brain tumor, Carson’s prognosis was grim; he was only given a 30-percent chance of survival. His parents were also told he would never walk. But at St. Jude, miracles happen. His mom remembers first seeing the St. Jude Memphis Marathon going on outside the hospital window when her young son was so sick and making a vow. “I said ‘I’m going to do that,’” Ginger Braun recalled. This will be her 13th year to participate in the marathon. The entire Braun family — uncle and grandparents included — will be a part of it this year. “It’s our way to give back and say thanks,” she added. Speaking of miracles, Brock Cassel is another one. Diagnosed at 18-months-old, he has since earned his first-year, five-year and 2018 survivor pins. Brock’s deep gratitude for St. Jude was reflected in his donation of $100 in coins he had been collecting over time. Yes, the connection to St. Jude runs deep at Benton Elementary, where the Tigers are sending their money and love to Memphis.